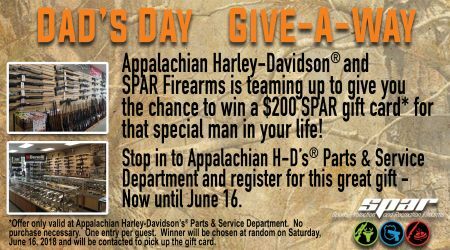 Stop in to Appalachian Harley-Davidson's® Parts & Service Department and register for this great gift - Now until June 16! *Offer only valid at Appalachian Harley-Davidson's® Parts & Service Department. No purchase necessary. One entry per guest. Winner will be chosen at random on Saturday, June 16, 2018 and will be contacted to pick up the gift card.